When sharing news or updates to employees in your company, there are different ways you can do it: 1) You could send out a lengthy email, document or report containing all relevant information, or 2) you can convey this information through videos. I wanted a way to share breaking company news, solicit and respond to feedback, and provide transparency into the business. […] this had to be something I could do from anywhere, since my schedule often requires travel. Read our blog post about videos you can create for onboarding new employees and training existing ones in new routines here. After several different attempts at ways of sharing updates, he tried using video as a tool to communicate to employees all over the world – with great success. Just hours after he posted his first video on Facebook at Work, (now known as Workplace by Facebook) it had been viewed by Hootsuite employees nearly 1000 times. 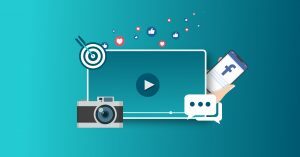 This is just one of many success stories of companies seeing a positive effect of using video for sharing news and updates to employees across different departments in the company. In this blog post in the series of how you can use videos for internal communication, we will share some examples of different types of news and updates you can share with your employees through video. When hiring someone new, you can create a very short video to present them to the rest of the team. You can interview them in a very informal way about themselves and their role moving forward, their interests and hobbies or what they want to do in their new position. Give other employees the chance to get a feeling of who this person is, and how they will fit into your team. Maybe you created videos for recruiting the new employee, and even sent them a welcome video before they started. You can now continue this great flow you’re already in, but this time you’re not creating a video for the new employee, you’re creating a video for the rest of the team or company. Want to create more videos? Try our video creation platform for free. Most reports that are created within your company can be made into videos, such as for example end-of-the-year reports. Using video to present your end-of-the-year report is a great way to summarize the year that has passed, and you might want to give your employees a little throwback to what you have managed to achieve: Who have you employed? What customers did you land? What important goals have been set and achieved? And also the fun stuff, such as: What company trips did you go on, and what were the best parts of this trip? All of this information can be answered in a more lively and fun way with video. As a bigger company, you might be restructuring or making other changes from time to time. You can send regular update videos to inform the employees about what is going on, to give updates on how the process is going, or inform them about how this will affect the structure of the company, etc. It doesn’t necessarily need to be information regarding restructuring, it could be other types of changes that are happening in your company as well. In this type of video, you can, for example, interview the CEO. Most large companies have many departments, and employees might have a difficult time keeping up with what is happening in all of them. Creating videos that introduce all of the departments and their area of work can be a good way to keep all the employees up to date and make them feel included in the team! If you’re feeling extra creative, you can have a regular video series to give your employees something to look forward to, and make it more engaging for all employees to keep up with your company (like Keeping Up With The Kardashians…but maybe not that dramatic). These videos can then be sent out through email, be included in regular newsletters, shared on the intranet platform that your company is using, or shown during department meetings, just to name a few ideas. […] It feels like people are more connected than before. The video serves as a kind of real-time window into the challenges and triumphs of everyone from the customer success team to the sales squad and the engineers working behind-the-scenes. Here is a short snippet of one of the videos where he shares updates for all employees at Hootsuite. This is a very simple video (a one-take clip), but you can also for example add posters with text and maybe some B-roll footage to spice it up a little! Want to create internal videos for your company? Try out our video creation platform for free.